Epidural injections into your spine are used to treat pain that spreads from your lower back down your legs. This is known as sciatica or radicular pain. Not everyone who has an epidural injection for lower back and leg pain finds it helpful. If you've been offered an epidural injection, it's important to understand what's involved so you can make a decision that’s right for you. An epidural injection contains two types of medicine – a local anaesthetic (which numbs the pain) and a steroid (which helps to reduce swelling and inflammation). They are also called epidural steroid injections. The liquid is injected into a gap called the epidural space, which surrounds your spinal cord. The local anaesthetic and steroid reduce pain and inflammation. Why would I have an epidural injection? Epidural injections can treat the pain in your lower back and legs that is known as radicular pain or sciatica. Your doctor may offer you an epidural for radicular pain associated with a number of conditions. These may include the following. 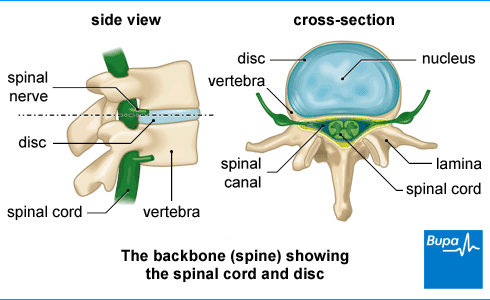 A slipped disc (herniated disc). This is when one of the discs between your vertebrae (back bones) bulges out of your spine, sometimes pressing on surrounding nerves. Spinal stenosis. This is when the space around your spinal cord narrows, putting pressure on your spinal cord. Spondylolisthesis. This is when one of your vertebrae moves out of position. Your doctor will only offer you an epidural injection if other treatments haven't helped to resolve your pain. Other treatment options that you'll usually try first include exercise programmes, psychological treatment and painkillers. If you decide to try epidural injections, you'll usually continue with these other therapies as part of a wider treatment plan. Epidural injections aren't a suitable treatment for everybody. For example, if you have a bleeding disorder, an infection or certain allergies, you shouldn't have one. Your doctor will tell you if an epidural injection is an option for you. What happens during an epidural injection? You'll need to go into hospital to have an epidural injection from a doctor who specialises in pain medicine. You'll usually have the injection and go home the same day – you won't need to stay overnight. You're likely to have a cannula (small needle) placed in the back of your hand before your doctor carries out the injection. Your doctor will carefully clean and prepare the area where you're having the injection, using an antiseptic solution. They may also give you a local anaesthetic to numb any pain while you're having it done. Your doctor will guide the needle to the affected area of your spine using X-ray images to help them find the right spot. They may need to inject a type of dye called contrast media to help highlight where the needle needs to go. Let your doctor know if you feel any discomfort as you're having the injection. It will only take a few minutes to give you the epidural injection but it may take longer to have imaging such as X-rays. It might take 10 to 20 minutes in all, to complete the procedure. You'll be taken to a recovery room after the procedure, where you'll be monitored for a short time before you're able to leave. Sometimes, you'll be asked to lie flat for around 30 minutes or more. You may have your blood pressure or pulse checked, and you'll be asked whether you're experiencing any side-effects. The nursing staff looking after you will make sure that you can stand up when you feel ready. You'll usually be able to go home within a few hours after your injection, and sometimes much sooner. But you will need somebody to drive you home – you won't be able to drive yourself. Ideally, you should also have someone stay with you for your first night at home after your procedure. Epidural injections don't work for everyone. Even if the injection works for you, it can take several days for you to feel the effect. In fact, your pain may get worse at first, as you’ll have some pain and tenderness in the area where you had the injection. This might take a few days to settle down. It's a good idea to keep a pain diary as this can help your doctor to see whether or not the injection has worked for you. How well do epidural injections work for back and leg pain? There's good evidence that epidural injections can help some people with back and leg pain. It’s important to realise though that not everyone gets pain relief from an epidural injection. You're more likely to benefit if your pain is due to a slipped disc, rather than spinal stenosis. And the injection is more likely to work if you haven't had symptoms for very long. If you do get pain relief from an epidural injection, it may be short-lived. However, some people do find that it works for months or even up to a couple of years. The amount of pain relief you get and how long it lasts varies from person to person. If it's beneficial for you, your doctor may recommend repeat injections. If an epidural injection does help to relieve your pain, it may make it easier for you to do physiotherapy, exercise programmes and other rehabilitation. This may then improve your quality of life and symptoms in the long term. What are the side-effects of epidural injections? The main side-effect associated with epidural injections is mild discomfort in the area where you have the injection. This usually gets better on its own very quickly. It's possible for the local anaesthetic from the injection to spread, causing temporary numbness or weakness in your legs. This should get better very quickly. More serious complications from epidural injections are fortunately rare, but it's still important to be aware of them. Complications include the following. Infection. You're at greater risk of developing an infection if you have diabetes or if you have a weakened immune system. If the injection site becomes warm or red and you feel hot and unwell, contact the unit where you had the injection. A dural puncture. This is when the needle has gone too far and entered the spinal fluid. You may develop a severe headache as a result. You may need to stay in hospital for longer if you've had a dural puncture. If you develop a headache after you've got home, take some paracetamol and lie flat. Contact your doctor if it carries on for longer than 24 hours. Bleeding into the epidural space (a haematoma). This is a rare but potentially serious complication. Very rarely, injury to another nerve. If you have ongoing weakness of your legs or incontinence after your injection, contact your doctor straight away. Your doctor will have measures in place aimed at keeping the risk of these complications as low as possible. Your doctor will go through all your treatment options with you, including what to expect from epidural injections. You'll need to give your consent if you do choose to have this treatment. A good way to decide whether or not to have any treatment is to weigh up the pros and cons (benefits and risks). Here is a summary of the pros and cons for epidural injections for lower back and leg pain. An epidural injection may reduce your pain for a certain amount of time. This can improve your quality of life and make it easier to get about and get on with your normal daily activities in the short term. If the epidural injection helps to reduce your pain, you may find it easier to do physiotherapy or other rehabilitation. This may help to improve your back problem in the long term. The side-effects associated with epidural injections are generally mild and resolve quickly. More serious complications are very rare. You might not get any pain relief from an epidural injection. Any pain relief you do get from an epidural injection may be short-lived and is unlikely to last more than a year. It isn't a cure for your pain. Although rare, it's possible to have a serious complication from an epidural injection. This includes an infection, an allergic reaction and nerve damage. Have a think about any questions you would like to ask your doctor before you decide whether to have an epidural spinal injection or not. Here are some example questions you might like to ask. What can I expect to happen after I’ve had my epidural injection? Will I be able to exercise after the injection? Are there any types of exercise that it's best not to do? Should I have physiotherapy or other some rehabilitation after having my epidural injection? How can I tell if my epidural injection has worked? How long will it take until I know if it's worked?